JetBlue Airways today announced it is again expanding its popular Palm Springs, California service with new nonstop Boston flights and an extended flying season in New York. Together the new route and new flights will link the Southern California desert oasis to the northeast with more nonstop service than ever before. JetBlue is the only airline to offer full-seasonal service between Palm Springs and New York City and will be the only airline to fly nonstop between Palm Springs and New England. JetBlue will add new, twice-weekly seasonal service between Boston Logan International Airport (BOS) and Palm Springs International Airport (PSP) beginning February 14, 2019. Palm Springs will become the 70th nonstop destination from JetBlue’s northeast focus city when the route launches this winter and advances JetBlue’s position as the number one airline Boston in number of flights, nonstop destinations and customers carried. JetBlue will operate the new route using its Airbus A320 aircraft featuring the airline’s award-winning service with comfortable seating; complimentary and unlimited name-brand snacks; more than 100 channels of free SIRIUSXM® radio programming and 36 channels of free, live DIRECTV® programming on personal seatback televisions; free Fly-Fi high-speed broadband internet service (a), access to JetBlue’s Hub content on personal devices, on-demand first-run Hollywood movies and the most legroom in coach (b). At New York’s John F. Kennedy International Airport (JFK), JetBlue will extend the Palm Springs flying season through Memorial Day 2019, a month later than typically offered in previous years. This comes as the airline prepares to launch JetBlue’s fourth season of service more than a month earlier than in previous seasons on October 10, 2018. 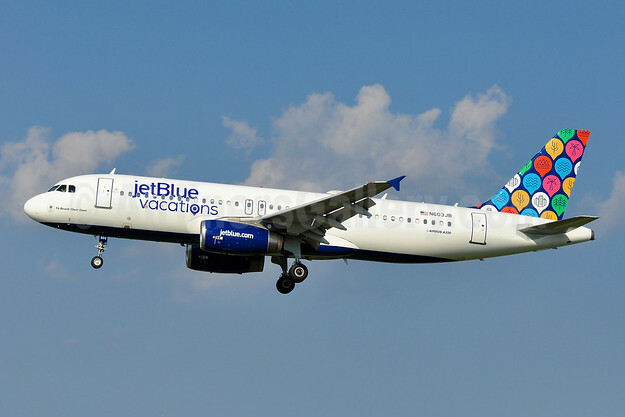 Additionally, in response to strong customer demand, JetBlue will operate its all-Core Airbus A321 aircraft on the New York-Palm Springs route daily during the peak of the season from February 14, 2019 through April 30, 2019. The larger aircraft will offer up to 50 additional seats in each direction every day. JetBlue’s A321 with the airline’s new core experience features 10-inch television screens offering free entertainment, comfortable seats with the most legroom in coach (b) and power outlets accessible to all customers. All A321 aircraft offer JetBlue’s free Fly-Fi high-speed broadband internet service (a), access to JetBlue’s Hub content on personal devices and on-demand first-runHollywood movies. Lastly, JetBlue has added additional Saturday Mint flights between New York-JFK and Palm Springs during peak travel weekends in January and February 2019. Like previously announced Palm Springs Mint service – which is set to operate daily over the holiday peak between December 20, 2018 and January 3, 2019 – the newly added Saturday Mint flights will operate as daylight flights in both directions in place of evening and overnight service. Mint offers a completely rethought design and a more personal approach to service, addressing the needs of the modern traveler. Mint showcases JetBlue’s exceptional hospitality from specially trained crewmembers. Favorite Mint features include lie-flat seating, a signature cocktail, a tapas-style menu by New York City restaurant Saxon + Parole, fresh espresso from the first purpose-built cappuccino machine for a U.S. airline, amenity kits by Hayward and Hopper, and dessert from local artisanal ice cream makers based in Mint cities. 10:55 a.m. – 2:01 p.m. 3:18 p.m. – 11:18 p.m.
8:00 a.m. – 11:15 a.m. 12:35 p.m. – 8:36 p.m.
Top Copyright Photo (all others by JetBlue): JetBlue Airways Airbus A320-232 N603JB (msn 2352) (jetBlue vacations) BWI (Tony Storck). Image: 943454. This entry was posted in JetBlue Airways and tagged Airbus A320-232, JetBlue Airways, jetBlue vacations, msn 2352, N603JB, Palm Springs on September 27, 2018 by Bruce Drum.